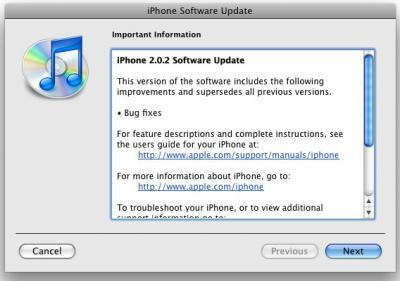 As predicted in a last minute rumor, Apple has released the 2.0.2 firmware for the iPhone. Apple helpfully describes the contents of the update as "Bug Fixes". It's not yet known if this software updates fixes rumored 3G connectivity issues. Steve Jobs was said to have promised a software patch "soon" to address that issue.